A version of this post was originally published in Portuguese by Maria Fernanda Cavalcanti on TheCityFix Brasil. Gafni, who received pushback from skeptical engineers in his paper-based endeavor, hopes that the novelty of this fibrous bicycle will indeed be less novelty and more reality. “It always excites me to take negligible materials and then turn them into something completely different; something useful,” said the inventor in a promotional video documenting the creation process. 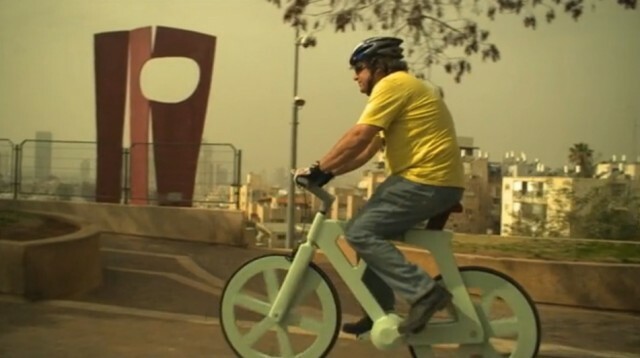 Gafni notes in the video that he drew his initial inspiration for the cardboard-bike from a similar effort to create a canoe out of cardboard. Though this bike may seem more of a concept piece, worthy of collection in Copenhagen’s Bicycle Library, the cardboard bike is a working prototype. The bike frame, wheel, seat and handlebars are all made from cardboard that is glued together and folded “like origami” for “three times the strength,” according to Gafni. To complete the seemingly absorbent body, a special paint—pictured above in green—is applied to give the bike a more sleek look than earlier versions. “My first prototypes looked like delivery boxes on wheels. They were hefty and it didn’t take much imagination to see that they were made of cardboard,” said Gafni, as quoted by Newsgeek Israel in Hebrew. The final product, with upgraded features, in mass production could be marketed anywhere between $60 and $90. That price range may very well be the cardboard bike’s greatest utility: it’ll be too cheap to steal. Bicycle theft is all too common, from Tucson to Tel Aviv, but with a $60 bike, the incentive to steal is low and in that rogue case that there is a theft, replacing a cardboard vehicle is almost as easy as recycling it.